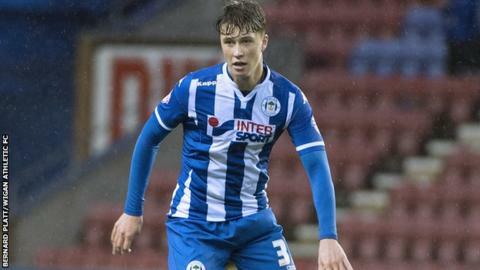 Shrewsbury have signed defender Jack Hendry on loan from League One rivals Wigan until the end of the season. Town boss Micky Mellon has opted to bring in cover for teenager Dom Smith, who is on international duty with Wales Under-21s this weekend. He will miss the Good Friday derby with Port Vale, while Mellon also has injury doubts over Jermaine Grandison and Zak Whitbread, who have "slight problems". Hendry, 20, has played three times this term since joining Wigan in September. But he has yet to make his English Football League debut for second-placed Wigan, which could now come on Friday at home for Shrewsbury in the local derby with Vale. Shrewsbury, promoted back to League One under Mellon last season, looked in real relegation danger of an immediate return to League Two a month ago. But they now stand 17th in League One, eight points clear of trouble, on the back of a six-game unbeaten run since their FA Cup exit to Manchester United and the key re-signing of loan striker Sullay Kaikai from Crystal Palace. "It's important to have that gap." said Mellon. "But I am always going to be trying to improve this team - and we move on now with a massive game on Good Friday." Jack Hendry was also a reported target for Premier League Everton, amongst other clubs, prior to Latics boss Gary Caldwell signing him on a four-year deal for an undisclosed fee. Prior to that, he had made five appearances for Partick since his debut on the final day of last season. "He is someone that a lot of the bigger clubs had an eye on," Town manager Mellon told BBC Radio Shropshire. "I've known him since he was at Partick Thistle and, since he came down here, I have watched him a lot. When the need came up with the situation we have with centre backs, I thought he was the right player to come in and help us."